Now that we’ve reviewed materials, and are familiar with the basics of steel, copper, aluminum, and brass, what is it exactly that we do with these materials? Depending on the material, we’ll either machine them or stamp them. Aluminum and brass are typically machined at our facility, while copper clad and steel are stamped. We’ve also covered different machining options, so what is metal stamping? A simple way to explain metal stamping is to say that metal is fed into a die, where punches pierce, form, and cut material into a finished part. 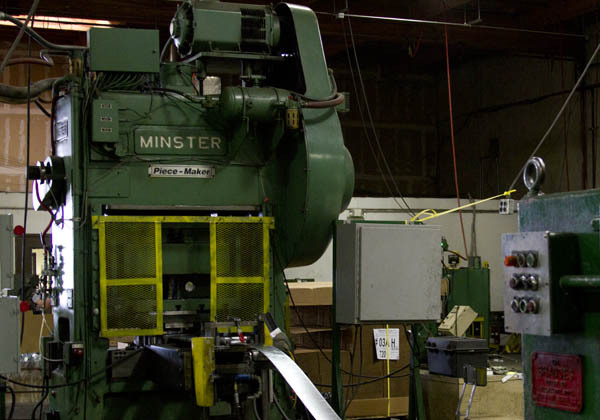 A more step-by-step explanation of metal stamping is the process of feeding coiled material from an un-coiler, through a material straightening device, into a die that is being ran by a punch press of varying speeds and tonnage. Is your head spinning yet? We’ll be taking the next couple of weeks to breakdown the process of what is happening, and the key concepts of a metal stamping operation deals with on a day-to-day basis. This is a Minster straight side style punch press. We’ll get into general information, and anatomy of a punch press next week. We’ve got a lot of topics to cover over the next couple of months, so check in here every Wednesday for a new topic on metal stamping. This entry was posted in Stamping on February 5, 2014 by johnatmetalproducts. I appreciate you taking the time to go through the stamping process. It is something I have been kind of curious about. Mostly because I have read a lot about the machining process. However, I was looking at your site and trying to find all of the more detailed posts on punch presses, feeders, etc. and couldn’t find them. Could you post a link to them here? Thanks for the comment, and the curiosity. If you go to the main home page of the blog, and continuing going through the archives you may find those posts. If you are still having difficulty finding them, let me know and I can email them to you.